Taiwan has a brilliant public transport system, which is to be expected for a developed country of such a high population density. Getting between cities in Taiwan is fast, safe and convenient. The transport infrastructure in Taiwan is not far off neighbouring Japan, but often costs a small fraction of the price. Taipei Main Station is the hub of Taiwan's transport, however the most of the infrastructure, including the conventional and high speed trains, and the MRT (subway) now lies in a complex web of tunnels and platforms beneath the iconic building. Inter-city buses depart from a bus station adjacent to Taipei Main Station, but it's reached from the underneath the station. The fastest and usually most convenient way to travel between cities along the populated west coast is to ride the high speed trains, known in Chinese as 'Gao Tie'. 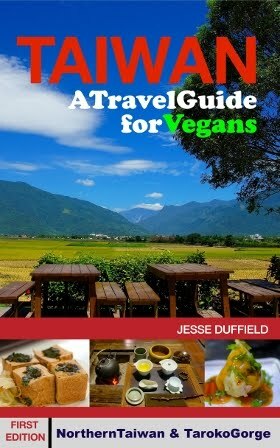 If you are in Taiwan a short time, and not on a particularly tight budget, this is the obvious way to get between cities. The trains are basically Japanese Shinkansens (high speed trains, sometimes called 'Bullet Trains' in English), however French engineers built the tracks, which had to be especially designed for Taiwan's exceptionally mountainous and terrain. With top speeds of about 300km/hr, they make the trip from Taipei to Kaohsiung in 96 minutes direct (a few a day) or about two hours if it stops at all the stations (as the rest do). As the inter-city transport of the future here, English signage is very good (and even grammatically correct), and tickets can be purchased online here. Discounts of up to 35% are offered for advanced reservations on selected trains. HSR stations are clean, spacious and have free wifi, and very much resemble public transport anywhere in the developed world. However, the HSR has its downsides. Firstly, its, not surprisingly, the most expensive way to get between cities. Prices are discounted during off peak hours, and occasionally during holiday seasons, but a ticket from Taipei to Kaohsiung generally runs to about 1600NT. While it's excellent value (little over half the price of travelling the same distance on the same train in Japan) it's still considerably more expensive than other means of inter-city transport. View from HSR Hsinchu Station platform (August 2014). Like many HSR stations, it was built several kilometres from the nearest centre (Jhupei), but high-rises are sprouting up all around it, and it is likely to become the future Hsinchu. Taxis are cashing in on its remote location. Another problem is that it's built for the cities of the future, which is no doubt intelligent planning, but for now, the stations are usually several kilometres out from the main city centres, which are generally centred around the (conventional) train stations. While shuttle buses run to the old train stations, the extra time taken often makes this hardly worthwhile. For example a journey from Taipei to Hsinchu takes half an hour on the high speed train or an hour on the (fastest) conventional train, but it takes most of the half hour saved to get from the Hsinchu HSR station (in neighbouring Jhupei) to downtown Hsinchu. So if going to downtown Hsinchu it's usually faster and cheaper to purchase train tickets in advance (but only if you can get a seat in advance). Tickets rarely sell out on the high speed train, but during the weekends they don't sell unreserved seats, so should they sell out, you won't be allowed on. This possible problem aside, the shuttle bus from the Taoyuan station to the airport makes the high speed train a fast, comfortable and otherwise very reliable way to get to the airport (also hope there isn't an earthquake, which understandably results in the immediate suspension of the system until safety checks are performed on all the tracks.) 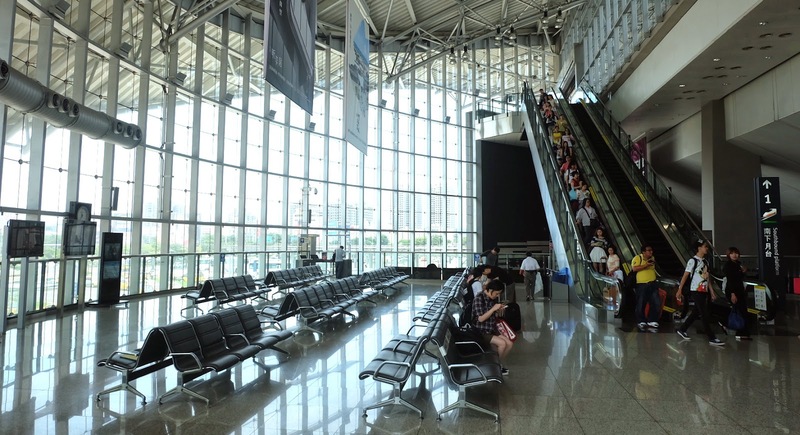 It's now also possible to check in bags for EVA Air and China Airlines (the two local carriers) at the Taoyuan HSR station, and then take the shuttle to the airport and go straight to the boarding gate. 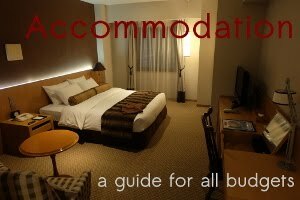 Ticket prices and train times can be found and reservations can be made here. Taiwan is a vibrant democracy, and train stations can be hive of political and social activity. Outside Taiching Station activists silently protest the treatment of imprisoned former president Chen Shui-bian, the use of nuclear power and call for the establishment of a new Republic of Taiwan. High school students collect shopping receipts (which can win money) for charitable causes. Taiwan Railways Administration Website for train times and ticket fares. Taiwan has a very good, if ageing, conventional train system, much of which was built when Taiwan was part of Japan prior to World War II. Most places around the perimeter of the island, especially on the west coast and top half of the east coast, are easily reachable by conventional trains. However, since the high speed train is clearly the face of Taiwan for tourists and business people, English on the conventional trains is somewhat limited, with 'Chinglish' signs usually present and comprehensible. Tickets don't say what platform the train leaves from, so often the easiest way to tell is to look at the signs announcing the departure times; it's unlikely that two trains will be scheduled to depart from different platforms at the same time. If trains are delayed (as they often are), the signposted time will still be the 'official' one (which will match the tickets), with the estimated delay usually announced in a small box on the right. Signs generally provide all this information in English, but it's still very confusing the first few times. If taking the train, allow extra time - especially for purchasing the tickets, as there are often queues - and finding the right platform. Train conductors, though they rarely speak any English, are always helpful, and a glance at your ticket and a point at the platform to go to or train to board is usually sufficient. A Tze-chiang (express) train. Chu-kuang trains look similar, but stop more often. Tze Chiang (express) trains are the fastest and most comfortable (and most expensive), so when going between major stations, these are the best bet. Seats are reserved, though if there are no seats (as is often the case if you don't purchase a ticket in advance) you can buy a standing ticket, though you sometimes have to ask for it as the clerk's often assume foreigners won't want one. So if in a hurry, it's best to ask for the fastest ticket and say a ticket without a seat is ok. These trains only stop at the major stations. Standing on these can be very unpleasant, as they have little standing room and are generally over-crowded with people trying to get to their destination as fast as possible, with people spilling out into the gangways and squeezing past each other in the aisle as they wander the aisles looking for a spare seat. The next fastest is the Chu Kuang, which is similar but slightly slower and stops at a few more stations. These are definitely not worth riding without a reserved seat. Taiwan has a pragmatic policy to empty seats. If you find an empty sit, you can sit in it. But if someone with a ticket for it comes along you must vacate it for them immediately. Likewise don't feel embarrassed to show your ticket to someone sitting in it - they know that's the policy. Obvious exceptions would of course be if the person was very old or disabled, but chances are they would have purchased seats in advance anyway. A local train in Taoyuan. The third type, the local trains, stop at every station. They range in quality from very old to sparkling new, and speeds also vary. While there is no allocated seating and only one row of seats along each side of the train, they are generally quiet except for the few stops before or after a major city. So if you are not in a hurry a local train can be a peaceful, relaxing (and very cheap) way to travel between cities, especially if you haven't reserved tickets in advance. I'd much prefer to spend two hours sitting on a mostly-empty local train reading a book than crammed into the gangway of an express train unable to turn around. Tickets are fairly self-explanatory, and can be purchased from the clerk, old (simple machines) or newer computerised machines. They do not say which platform the train leaves from, but this is usually easily identified by the time. If possible it's a good idea to purchase a a return ticket at the same time, as it brings a slight discount and a greater likelihood of a seat for the return leg. Tickets bought at the counter can be changed or refunded if you can't use the return one as planned. One window often has a sign up advertising that that clerk speaks English - but in reality this may not always be the case. It's probably easiest the first time to go to a clerk, even if you need to show them a note for where you want to go in Chinese. These aren't especially complicated, but they can't give tickets with allocated seating (a ticket with a seat is the same price at the counter or other machine below), so are really only worth bothering with for short hops on the local train, as there are rarely queues at them. They don't take notes, but there is usually a change machine nearby. 2. Select train type (these work best for local trains as they can't allocate seats). 3. Select fare type (full fare unless you are a student or elderly). Buttons for stations will light up if you have entered enough money for them. Add more if necessary. Your ticket and change will appear. These newer, bilingual machines dispense all types of tickets, but queues can be as long as the (staffed) ticket counters, and tickets bought at these machines cannot be changed or refunded. Most main stations also have newer, bilingual, computerised machines. The downside of these machines is that you can't refund or change their tickets. Should you miss the train, you can still board a different train, but you won't get a seat. See Also: A One-page Comparison of Train Types in Taiwan. Inter-city buses in Taiwan are very comfortable (unlike local buses). Taiwan also has a thriving and quickly-developing intercity bus network. 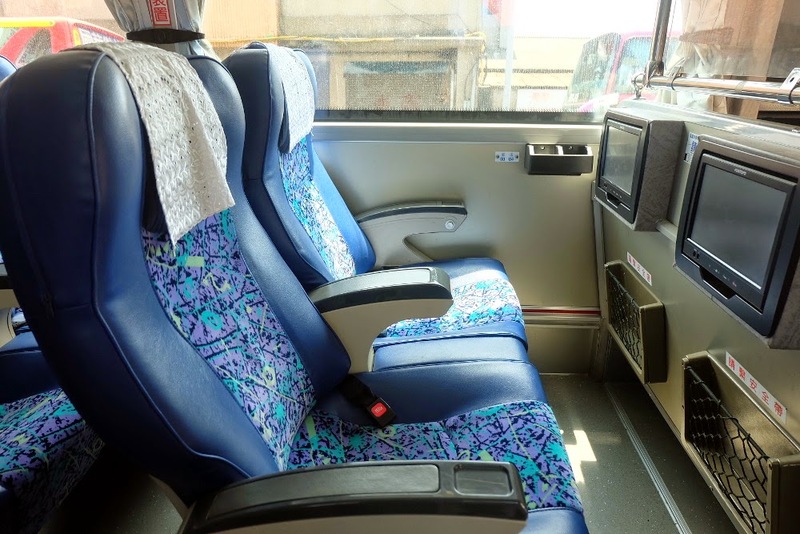 These buses are generally run by private companies, and their standards of the buses are generally very high, and of course you are guaranteed a seat, usually a very comfortable one. Many buses have only three seats abreast, so it's possible to have your own seat if desired (and if you're early enough). 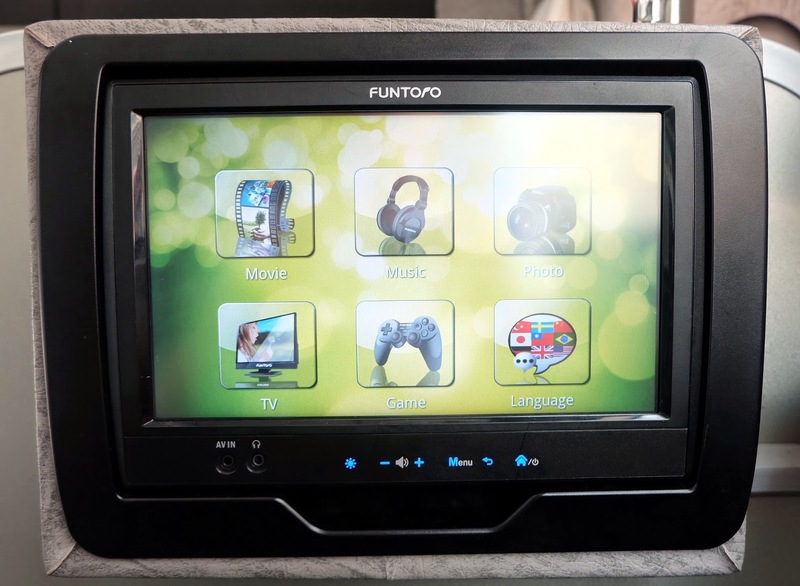 These Guo Guang buses have aeroplane-style entertainment, including a (limited) English touch-screen interface. Prices are usually lower than even the conventional train, and are more environmentally friendly, because trains are over-engineered and therefore very heavy, and because buses stop less frequently than trains and are more likely to be full. Also, buses to major destinations seem to often leave when full (which never takes long) so you can generally get a seat without needing to book in advance wait very long. Intercity bus stations are generally bilingual (at least in Taipei) and navigating the intercity bus systems should be fairly straightforward, even without speaking or reading any Chinese. 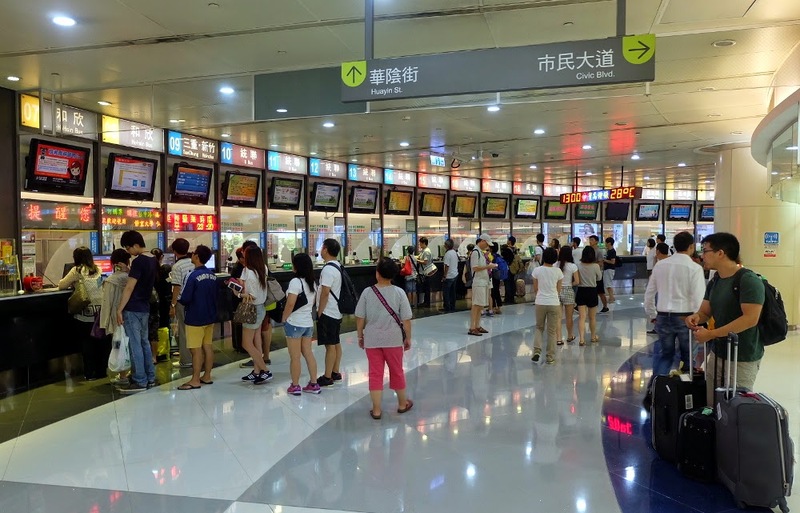 The most useful bus station for most people is the main Taipei Bus Station, which is opposite (and just north of) Taipei Main Station and connected through the underground passages (follow directions to Taipei Bus Station or Q Square, the inevitable shopping mall on the lower floors). Tickets are sold on the 1st floor, and buses depart from the upper floors. It's not always clear which buses leave for where and when, but the information counter staff speak English and are very helpful. Taipei Bus Station ticket counter (1st floor). Taipei West Bus Stations are two separate terminals (A and B) a few minutes walk west of Taipei Main Station. 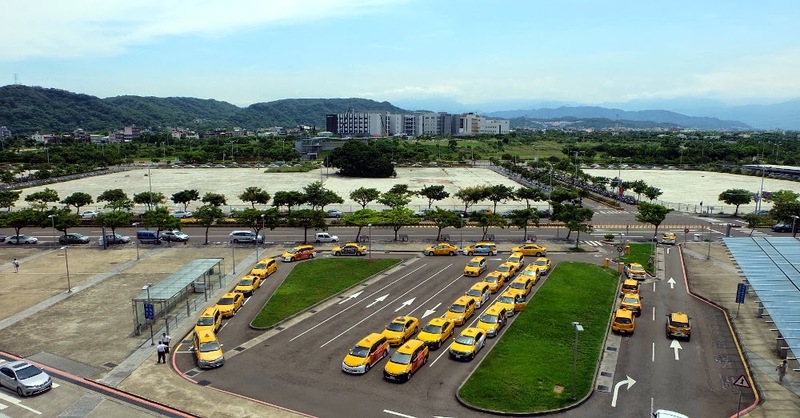 The main destination likely to be of interest to travellers is that the bus to Taipei Taoyuan International Airport leaves from Terminal A. To get there, take any South Exit from the main station, continue until you reach the main road (Zhongxiao West Road, Section 1) and follow it about a block to the right. These bus stations are not linked up to the underground passages which link the rest of the public transport hubs in the area. Taipei West Bus Station's two adjacent terminals (from left B and A) are just west of Taipei Main Station. For such a densely-populated city Taipei has good traffic management and infrastructure, but traffic jams are still a problem at rush hour, and they can easily add half an hour to get out of Taipei and another half hour at your destination. There are bus stations at Taipei City Hall (close to Taipei 101), Xindian Station (the southern end of the MRT). Some buses also stop at Yuanshan Station (red line) before heading south. If these are close to your hotels it's well worth taking a bus to or from these stations for Taoyuan Airport. 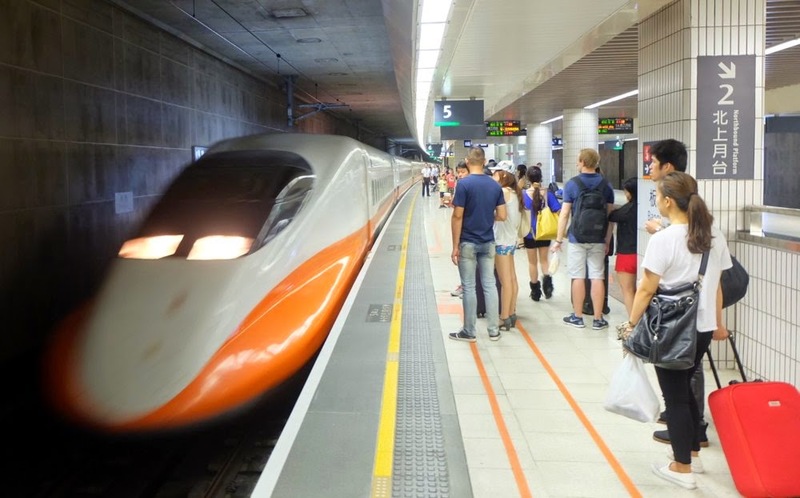 High Speed Rail 0:30 (+ commuting) 315 Fast, comfortable Stops in Jhupei, 30 mins by train or shuttle from Hsinchu. Little time saving for extra cost. Tze-Chiang (Express) 1:00-1:10 180 Can reserve a seat in advance. Very uncomfortable journey if no seat. Book these tickets well in advance, especially to/from Taipei at peak times. Local Train 1:30-1:40 115 Generally quiet with free seats outside main cities. Can't reserve a seat. Stops at all stations. Bus 1:20 (in good traffic) 130 Guaranteed a comfortable seat without a booking ahead. Least comfortable ride. Can take much longer in rush hour traffic.